Gainer based on the best source of protein and quality carbohydrates, which also have been reinforced with minerals! Added a set of enzymes for even faster assimilation of nutrients! Extreme weight and strength is within reach! Currently, the most advanced post-workout supplement other would be. The meal eaten after exercise is of utmost importance for the development of lean body mass. 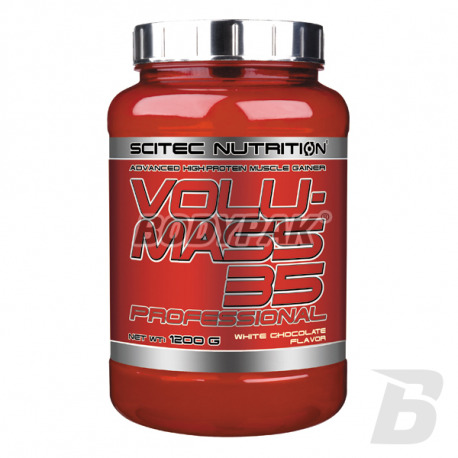 Scitec Volumass 35 Professional - the most advanced post-workout supplement other would be. The meal eaten after exercise is of utmost importance for the development of lean body mass. - Currently the most advanced post-workout supplement other would be. The meal eaten after exercise is of utmost importance for the development of lean body mass. Formula Volumass 35 Professional has been designed specifically to maximize the so-called. anabolic window that opens after a hard workout. 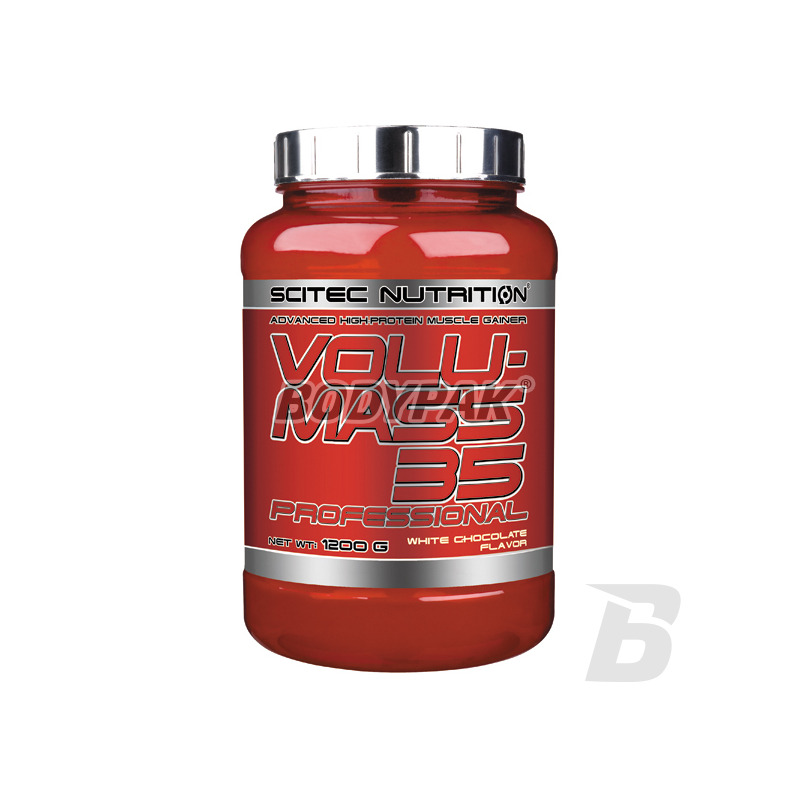 Scitec Volumass 35 Professional contains more creatine, more high-quality protein and good carbohydrates quickly and slowly absorbable enriched with BCAA, Glutamine, Taurine. This innovative supplement will increase your weight by supplying the body with the necessary calories without causing an increase in body fat. * Obecność soli spowodowana jest naturalną zawartością soli sodowej w produkcie. Składniki: Koncentrat białek serwatki (wyprodukowany z mleka, emulgator: lecytyna sojowa) zawierający laktoglobulinę, laktoferrynę, laktoalbuminę oraz frakcję immunoglobulin, Maltodekstryna, Dekstroza, biała czekolada w proszku (sacharoza, masło kakaowe, 33,4%, pełne mleko w proszku), kawałki czekolady [cukier, masa kakaowa, kakao w proszku o zredukowanej zawartości tluszczu, emulgator (lecytyna rzepakowa), masło kakaowe (1%)], Skrobia kukurydziana, proszek kakao o zredukowanej zawartości tłuszczu (10-12%), Monohydrat kreatyny, aromat (czekoladowy), Palatynoza (izomaltuloza), L-glutamina, Tauryna, L-alanina, mikronizowany Monohydrat kreatyny, substancja zagęszczająca (Guma ksantanowa), Cytrynian kreatyny, Izolat białek serwatki (wyprodukowany z mleka, emulgator: lecytyna sojowa), substancje słodzące (Acesulfam K, Suklaroza), Kreatyna bezwodna, Pirogronian kreatyny, Kwas pteroilomonoglutaminowy. High-quality conditioner of "bulk" of almost equal amounts of carbohydrates and protein per serving (1: 1). It facilitates balancing dity and remedy shortfalls of nutrients. It tastes good and does not deal with the problems of solubility! The unique carbohydrate-protein supplement MyoMax is responsible for the development of muscle mass and maximum acceleration of regeneration. Top-quality preparation for the rapid build muscle mass. The preparation help for people resistant to gain new muscle. 1.5 g of creatine and taurine 0.5g per serving!